I had an hour or two to kill today, and I decided I would retreat from the heat and humidity of August in Venice to a nice little cafe with a powerful AC system that the people who work there keep cranked up to the max. There is often a complimentary copy of The New York Times hanging around inside, but just as often it has been pilfered – or “half inched” as they say in Cockney rhyming slang – so it is always a good idea to have a plan B for something to read. Right now, I’m reading Borne by Jeff VanderMeer in Italian, which is a challenge to say the least. The Google Translate app I’ve downloaded to my phone sees a lot of action. It’s a particularly attractive, hard back edition that anyone can be proud to be seen reading at a cafe, it’s always in my bag, and so I had a good plan B. On the way to the cafe today I took a back street that goes past a comic book store and a second hand bookstore. The comic book store had some very nice graphic novels, but nothing for much less than fifteen euros, which is outside my impulse-buy budget. It’s a great shop, and I like to pop in, but only ever for window shopping. The second-hand bookstore, on the other hand, only has two price points. The books there either cost one euro, or double that. They are mostly an interesting collection of water-damaged and dog-eared paperbacks that have been sold to the shop by aging locals. They offer an insight into tends in popular culture and cover design in the Italian publishing of yesteryear. Of course, I always look through them, marveling and cooing in delight at the covers of various cheesy 1970s editions of action stories and romances. I wasn't expecting to see anything in English, much less something readable, but I was surprised by a real gem. 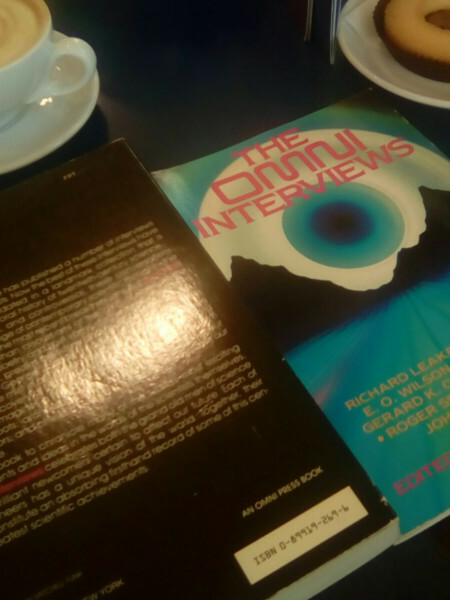 I found a copy of a book called The Omni Interviews, edited by Pamela Weintraub, with a psychedelic cover designed by Regina Dombrowski. It is a selection of interviews from Omni magazine in a paperback that was published back in 1984. Omni was a science and science fiction magazine that contained articles on science, parapsychology, and short works of science fiction and fantasy. It was published as a print version between October 1978 and 1995. The first Omni e-magazine was published on CompuServe in 1986 and the magazine switched to a purely online presence in 1996. It ceased publication in late 1997. Artificial-intelligence wizard John McCarthy imagines a high-tech door-to-door delivery system manned by robots. I gasped. I instantly recognized the system McCarthy is talking about, in a book published in 1984 that includes mostly interviews from the late 70s and the very early 80s. He was talking about Amazon, and not the Amazon of today, the Amazon of the future. We don’t use the word robot for these automated delivery machines with AI anymore, we call them drones – but this is exactly the future we’re hurtling toward, at least if Bezos gets his way. The insight needed to imagine, way back in the late 70s/early 80s that this was where AI was heading, and the flash of inspiration to include this in the blurb of the book impressed me enormously. 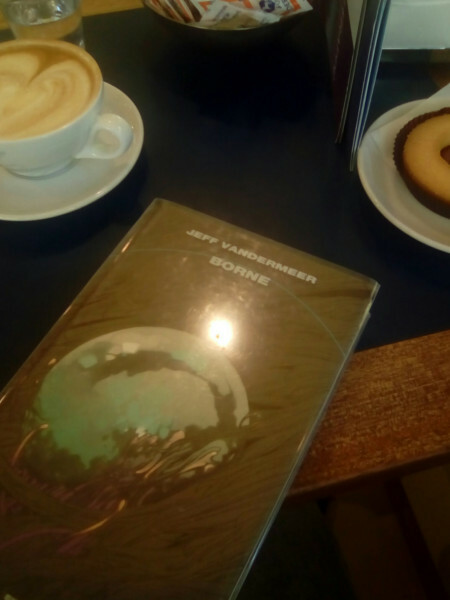 I bought the book, headed to the cafe, nabbed my favorite table by the door, ordered a cappuccino with soy milk and a frollino with chocolate filling (I'm a strict vegetarian – in fact most of the time I’m vegan – but I do compromise on things I have trouble resisting, like chocolate). With everything set up just the way I like it I settled down to kill some time reading. I quickly wrote this blog post on a notes app on my phone, too. It was only as I finally got round to opening my new book that I saw I was out of time and I had to rush off to my next appointment.